clear waters of the many lakes, the quaint streets and town of the old city seems like the fantasy land from a story book. In fact, when I was walking on the delightful Getreidegasse, or Grain Alley, I was reminded of Diagon Alley from the Harry Potter books. Earlier in the day, I had taken a bus from Vienna to get here. The autobahn look us through the Vienna Woods on the outskirts of the city. Before that, we also passed in front of the Schonbrunn Palace with it's pretty gardens and the world's oldest zoo. 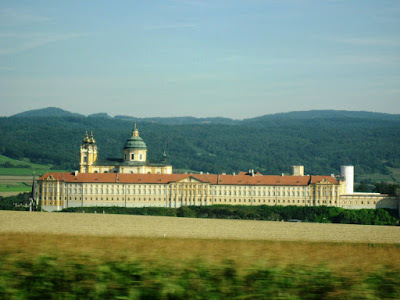 Soon, we were passing the green countryside of Melk and the Austrian wine country. Austria doesn't export much, it does produce a variety of wine for internal consumption. Melk is also home to the Benedictine Abbey immortalized in Umberto Eco's The Name of The Rose and home to a well stocked library of ancient manuscripts and scrolls. The industrial city of Linz, where we stopped for a snack, was the birthplace of Adolf Hitler. He built some his heavy engineering factories here, making it a target for Allied bombing during WW2. Even now, this area is home to much of Austria's engineering, steel and automobile industry. 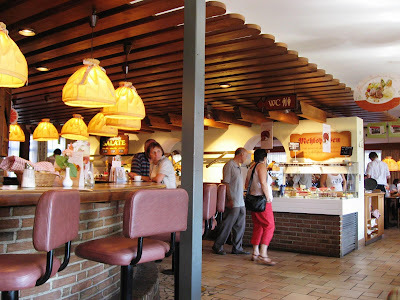 The cafe on the autobahn was charming and the pastries and coffee they offered were excellent! After some more time, we were in Alpine country. Imposing mountains and pristine lakes, surrounded by rolling meadows, wooden chalets and flocks of flowers in every window sill stretched out for miles. 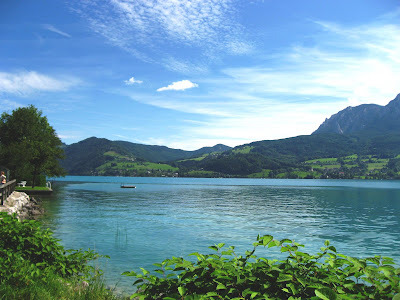 The Attersee is the largest lake in this area and the villages around it are popular tourist hang-outs. The place seemed like a replica of the Interlaken are in Switzerland. To that, one local snorted, "Our lakes are cleaner. You can fill up a glass and drink this water". When I asked if they really did that, he chuckled, "Of course not, we prefer beer!" Along with their German neighbours, Austria is among the largest per-capita consumers of beer. 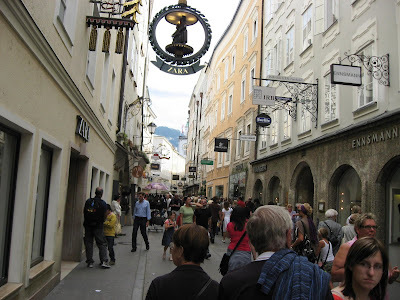 We entered the city of Salzburg soon after. It was an excellent day and the cold mountain breeze felt really good, especially since the sun was shining too! The fact that Mozart was born here is evident everywhere: from the Mozart chocolates and liquers on display to the Mozarteum University in the center of the city. I walked into the flower-filled gardens of Mirabel Palace with its many fountains and statues, made famous by Sound of Music. 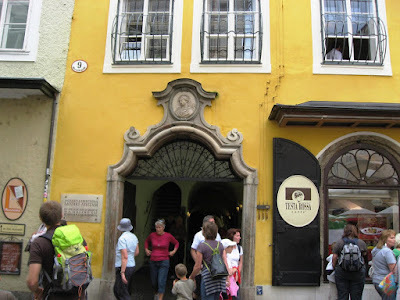 I continued past the old Baroque church, Doppler's house and over the bridge on the Salzach River into the Old City. The view from here with the distant mountains, the old fortress on the hill-top and the many baroque minarets and domes was amazing! We strolled through the quaint lane of Getreidegasse; Mozart was born in an apartment here. In the picture, do you notice the set of handles that - through a pulley and lever system - operate doorbells in the apartments? Salzburg got it's name from the salt that was mined from the hills here; those days it was 'white gold' and made its rulers rich. 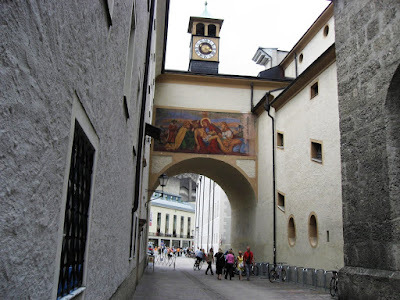 Salzburg was ruled by an archbishop for many years, having been a Roman colony before that. Most of the architecture here is early Baroque and created by Italian architects. Later Austrain architects came in from Vienna to build some of the late Baroque buildings and churches. The bishops lived like kings. While they weren't allowed to marry or have a family, most had mistresses. I was told the archbishop had 15 children and didn't even bother hiding it like the others. People didn't dare open their mouth to protest; neither did the Pope who needed his help in fighting the Lutherians and Protestants. We walked past the ancient clocktower, past the imposing Cathedral dedicated to St. Rupert, and into the ancient cemetary beside the hill. On the top of hill stands an old fortress, and on the rocky hillside is the entrance to the Catacombs, an ancient set of tunnels built into the rock. As I walked through the lanes of Old Salzburg again, I noticed houses dating back to the 13th century. After a detour to buy my daughter a toy, I walked back to Mirabel Palace and rested my tired legs in a garden cafe. The light was beginning to fade as I took the bus back to Vienna. This time too, the autobahn cafe we stopped enroute was as charming. I was hungry now and ordered an Asian Wok, which was tasty but made with Italian-style pasta instead of the usual Chinese noodles! Back we went, over the Danube and through the darkening countryside. The Danube is Europe's second longest river (after the Volga) and many important cities, including Vienna, are located on its banks. It was late when I got back to my hotel. I went straight to bed; tomorrow was going to be a busy day and I had to get up early. What a wonderful and readable post and with beautiful picture. The Danube districts looks so wonderful and fresh, nice and quiet - I just love landscape like this (it reminds me quite a lot about Norway of course). There is a lot of European history in this too and of course I remember the Sound of Music - must have been wonderful to be there - thanks for taking us with! Ah a whole post without a single picture of food - so much unlike Shantanu! The slideshow is a great idea :) Salzburg is beautiful place. regular reader of your blog, curently im in pune - off topic query here - can you tell me whats the best place for birthday cakes in pune? @rennyba: If I remember correctly, we crossed the Danube even during our Switzerland trip. @inderjit: There are a few, but I usually go to Copper Chocs for my cakes. I especially like their made-to-order cakes made of fresh, seasonal fruits (not on their catalogs). In the past, I have tried their cakes of fresh peach, strawberries and oranges. Salzburg is beautiful place. Enjoyed the slideshow. Pictures are just awesome !! @cuckoo: Thank you and welcome to my blog! I see you have a wonderful blog on travel too. @lakshmi: Glad you enjoyed the photos. This time of the year the weather is great too in Salzburg! 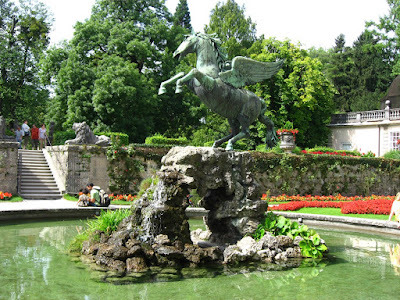 Isn't Salzburg also famous for 'The Sound of Music'? @arnab: Yes it is. The movie was based on a real-life story of a Salzburg family. The movie was shot in and around this city too. 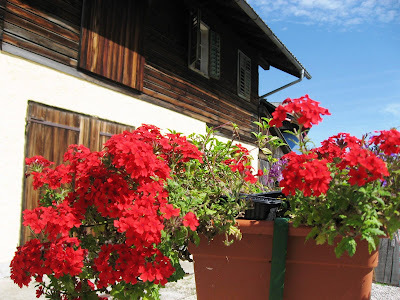 That was a lovely post indeed, I have been wanting to visit Salzburg mainly coz of Sound of Music , now the second reason is your blog post. @Shalini: Yup, this place is awesome for its music, scenery and the history!